Ready. Aim. Fire! 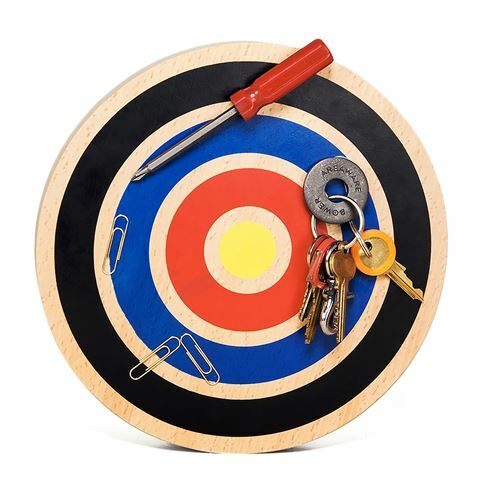 With Areaware’s quirky Key Target you can transform the mundane task of hanging up your keys into a playful one. It’s crafted from beechwood, with a bright, colourful design that is reminiscent of Jasper Johns’ mid-century paintings, so it will look fabulous on your wall at home. Simply toss your keys, or small metal items toward the bullseye and ensure that you never misplace them again. Includes a branded key ring. Convenient hanging holes for mounting on your wall. Strong magnet holds your keys and other small metal objects.